Perched strategically behind a telephone pole on South First, a metal sculpture “police officer” complete with look-alike “radar gun” pointed toward oncoming traffic. This guy is just a friendly reminder that you really don’t have to be travelling that fast, especially while driving on South First. This is a short drive worth cruising. 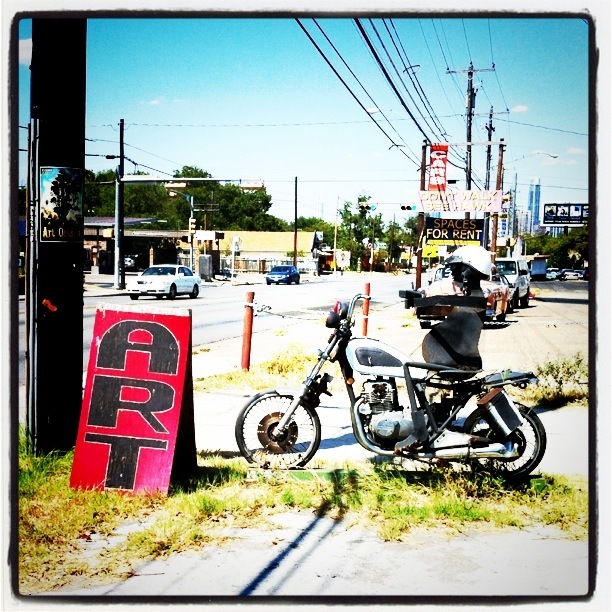 South First is home to Bouldin Creek Coffee (their sign reads, “local caffeine dealer), a plethora of vintage/re-sale fashion clothiers, brake worthy restaurants, art galleries, one of Austin’s infamous “trailer food” stopes, and plenty of people to watch. So, “go ahead… make my day…” and take a drive down South First. Only, be sure to drive the speed limit… or you may get pulled over by our metal cop. Someone needs to put a Dunkin Donuts cup on that. Fun post. I know! I love how big his tummy is!